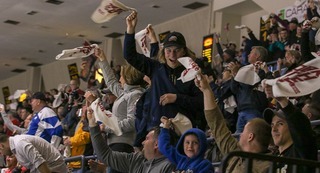 Saginaw, Michigan – The Saginaw Spirit’s third period comeback against the Sault Ste. Marie Greyhounds came up short on the Third Annual Can Council Super Hero Night. The Spirit drop the fourth meeting of the season against the Greyhounds, 7-4. The Soo Greyhounds had the first scoring opportunity in the game 47 seconds into the opening frame with breakaway chance from Brighton, Michigan native Keeghan Howdeshell. After a blocked Spirit shot at the blueline and Spirit overager Reagan O’Grady stumbled, Howdeshell was all alone to take a wrist shot that Arizona Coyotes prospect Ivan Prosvetov deflected into the corner with the blocker. Prosvetov came into the game riding a hot streak, allowing just one goal on 88 shots faced in his last two starts and notched his second shutout of the season. Saginaw nearly took the lead just under four minutes into the game during a man power advantage. Spirit captain Damien Giroux drifted in from the boards and took a wrist shot from the left faceoff dot that beat Los Angeles Kings prospect Matthew Villalta short-side but hit the left post. The Minnesota Wild prospect came into the game second on the Spirit with 11 goals on the season. The Spirit found the back of the net just over 11 minutes into the opening period. Jackson, Michigan native Blade Jenkins slid a nice pass from the boards that was one-timed into the net from rookie Camaryn Baber. The goal was the second of the season for the Sault Ste. Marie, Ontario native. Saginaw took the 1-0 lead into the first intermission. The Greyhounds had two point blank opportunities to tie the game just over a minute into the second period. After a Spirit turnover in the defensive zone, Soo rookie Rory Kerins took a shot from the bottom of the left circle that Prosvetov blocked with the blocker. The rebound shot from Roman Pucek was corralled between the body and glove hand of the Russian goaltender. Saginaw’s Nicholas Porco nearly added to the Spirit lead just over seven minutes into the second period. After being sprung on a three-on-one rush, Ryan Stepien sent a saucer pass over to Porco for a one-timer from the top left side of the crease. The shot beat a sliding Villalta but hit the left post. Just over a minute after the Porco scoring opportunity, the Soo Greyhounds Keeghan Howdeshell tied the game. Defenseman Robert Calisti took a one-timer from the point that was deflected up by Howdeshell and into the Spirit net. Sault Ste. Marie’s alternate captain Morgan Frost gave the Greyhounds the lead just 47 seconds after the Howdeshell goal. Overager Jordan Sambrook sent a pass from the right circle to the front of the net for the Philadelphia Flyers prospect to redirect into the Saginaw net. It was the 17th of the season for the 2017 first round pick. Saginaw’s Cole Coskey brought the Spirit back even with his 10th of the season with just over eight minutes left in the second period. 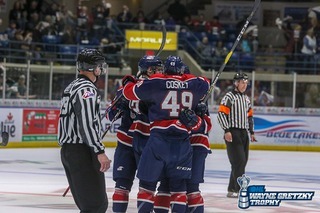 Saginaw first round pickCole Perfetti sent a quick pass to the top of the crease for Coskey to one-time in the net. Detroit Red Wings prospect Brady Gilmour added the secondary assist on the goal. The Greyhounds retook the lead with just 1:30 remaining in the second period on the powerplay. After Morgan Frost dropped the puck back to the point, Toronto Maple Leafs prospect Mac Hollowell skated to the top of the left circle and took a slap shot that deflected off a Saginaw player past Prosvetov. Hollowell came into the game third among OHL defenseman with 29 points. Keeghan Howdeshell added his second of the game to give the Greyhounds a two-goal lead 1:25 into the third period with a shorthanded goal. 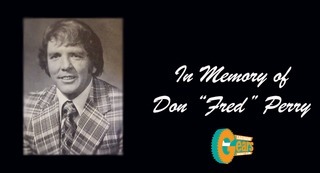 After the Spirit turned the puck over in the neutral zone, Morgan Frost pass the puck to Howdeshell, who deked and slid the puck through the Spirit goaltenders five-hole. The shorthanded goal was the Soo’s ninth of the season which is good for second among OHL teams behind the Sarnia Sting. Howdeshell completed the hat trick just over three minutes later with his team leading 20th goal on the season. The Michigan native took a wrist shot from the top of the slot that beat Prosvetov’s blocker. The Greyhounds added another goal less than a minute later from rookie Alex Johnston. Johnston took a wrist shot squeaked just under the crossbar from the left faceoff dot to give the Soo a 6-2 lead. Saginaw cut the lead to three with just under seven minutes remaining in the game on the power play. New York Islanders prospect Blade Jenkins one-timed a shot in front of the net that hit the right post. Jenkins swatted the rebound out of midair into the net for his eighth goal of the season. Just under three minutes later Cole Coskey added his second goal of the game to bring Saginaw back within two-goals. Cole Perfetti’s one-time shot rebounded off of Villalta’s pad to the top of the crease for Coskey to hammer into the back of the net. The goal was the second powerplay goal of the game for the Spirit after struggling on the man power advantage in the past games. The Soo’s Morgan Frost added an empty net goal to give the Greyhounds the 7-4 win. The Spirit begin a three-game road trip starting with the Niagara IceDogs Thursday, December 6. The Spirit dropped the first meeting of the season against the IceDogs, 3-2 in a shootout back on October 27. Puck drop is set for 7:00 p.m. at the Meridian Centre in St. Catharines, Ontario. Fans can catch the action on FM Talk and Sports 100.5 and fmtalk1005.com with Joey Battaino and Dennis Desrosiers on the call. 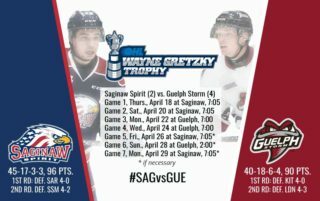 The Saginaw Spirit return home Friday, December 14, to take on the rival Windsor Spitfires for the fourth of eight meetings this season. 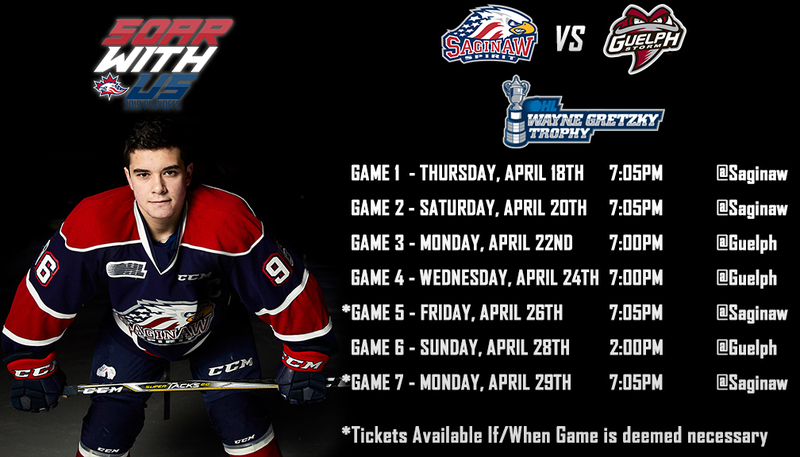 The Spirit are looking to break a three-game losing streak against the Spitfires to start the season. 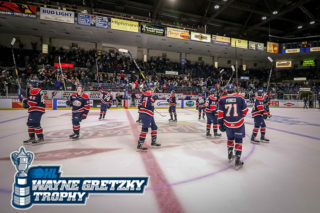 The puck drops in The Dow Event Center at 7:05 p.m.
To purchase tickets to any Saginaw Spirit home game call (989) 479-7747, visitsaginawspirit.com, or by visiting the Saginaw Spirit Store at 5789 State Street, Saginaw, MI.